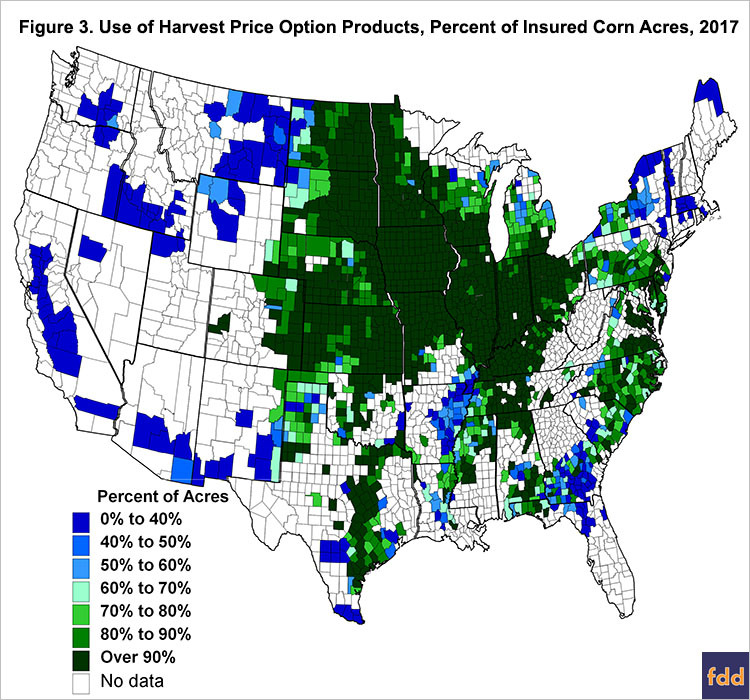 Over time, farmers have migrated to revenue crop insurance products with the harvest price option (HPO). Today, products with HPO are used on over 90% of the insured acres in many Midwest counties. HPO is a feature of crop insurance that has come under scrutiny in recent farm bill debate, with some suggesting its elimination and others suggesting reducing premium support for HPO. How farmers will react to changes to HPO remains to be seen. Farmers currently can purchase crop insurances that are either yield-based or revenue-based. Revenue insurances are further divided into two categories, those with the harvest price option (HPO) and those without. An HPO policy will increase its guarantee when harvest price exceeds projected price, as often happens which happens in short crop years. Revenue Protection (RP). RP is a revenue insurance who’s guarantee increases if the harvest price is above the projected price. That is, RP is an HPO insurance. RP with harvest price exclusion (RPhpe). RPhpe is a revenue product that does not include the HPO. Yield Protection (YP). YP is a yield insurance. Area Risk Protection (ARP). ARP is a revenue product with HPO. ARP with harvest price exclusion (ARPhpe). ARPhpe is a revenue product without HPE. Area Yield Protection (AYP). AYP is a yield insurance. To summarize, two plans have HPO: RP and ARP. As will be shown below, most use of HPO comes from RP as ARPI is used on relatively few acres. As illustrated in Figure 1, RP is the most purchased product in Illinois for corn. This figure shows the use of RP, RPhpe, and YP. Because of their small acres, ARPI plans are aggregated together. Of the ARPI plans, ARP represents the bulk of the use. In 2017, ARP was used to insure 95% of acres insured with ARPI plans. The COMBO product did not exist before 2011. In Figure 1, acres insured using predecessor products are shown. The RP line shows acres in Crop Revenue Coverage (CRC) and Revenue Assurance (RA). The RPhpe line includes acres in Income Protection (IP). 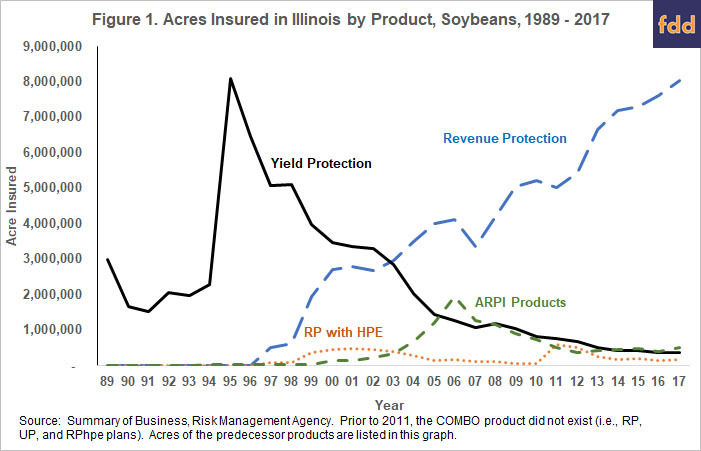 The YP line shows acres in Actual Production History insurance. ARPI use also did not exist from the beginning. Group Risk Plan (GRP), and Group Risk Income Plan (GRIP), and GRIP with the harvest revenue option are shown before ARPI existence. Prior to 1993, yield insurances were the only plans available. ARPI-like products became available in 1993. Revenue products were not available for sale until 1997. Yield insurance hit their highest use on corn in 1995, after the passage of Federal legislation requiring the purchase of crop insurance to be eligible for other Federal benefits. This requirement then was repealed. Yield insurance use declined and was gradually replaced by revenue insurance with HPO (see Figure 1). At no time did revenue products without HPO even come close to the use of HPO insurance. In 2017, RP was used to insure 8.8 million acres, or 90% of the total acres. Another 518,000 acres were insured by ARP an area plan with HPO. In total, 96% of corn acres were insured with an HPO insurance in 2017. Similar trends exist for soybeans. 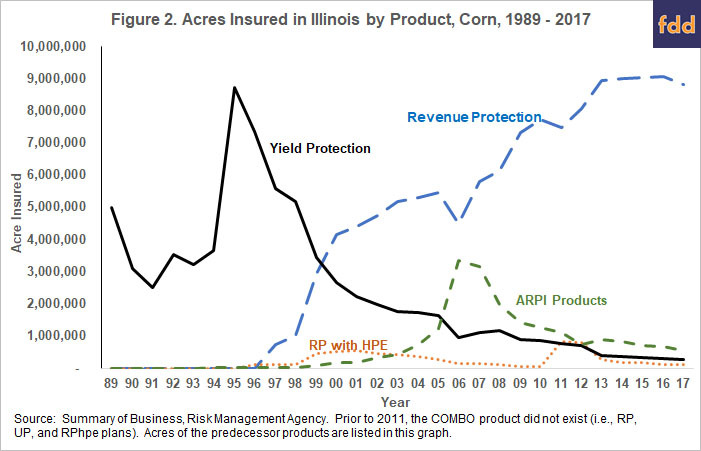 RP has grown over time and now includes the majority of acres insured (see Figure 2). In 2017, RP was used to insure over 8 million acres, representing 88% of acres. High levels of use are not confined to Illinois (see Figure 3). In 2017, most counties in the greater Midwest have over 90% of their corn acres insured using HPO products (i.e., RP and ARP). High levels of HPO use exist also exists on the eastern seaboard and over much of the Great Plains (see Figure 3). There are isolated areas where HPO products do not account for the majority of use. These occur in Georgia and Florida, along the Mississippi River, upstate New York, and in areas of the far west. These areas may have more yield risk than areas using revenue products. Farmers have six combinations of Federal crop insurance products and farmers overwhelmingly choose those two that have HPO. It is unusual for farmers to overwhelmingly choose a feature unless there is something compelling about that feature, particularly if that feature has a higher cost. Farmers will always pay more for RP as compared to YP and RPhpe. How much more depends on the area. In central Illinois, RPhpe will have premiums approximately 60% less than RP and YP will have slightly higher premiums than RPhpe. Both yield and price declines can lead to income shortfalls. Since revenue products cover yield and price decreases, there would be a natural preference to choose revenue insurances over yield insurances. Why though, farmers prefer revenue product with HPO over revenue products without HPO has to do with the protection offered by HPO. RP’s guarantee increase is particularly useful in short crop years. In the Midwest, one of these events are drought years like 2012. In 2012, for example, the projected price was $5.68 per bushel and the harvest price was $7.50 per bushel. Farmers would have to have substantial yield losses before an RPhpe would make a payment. In those drought years, farmers would face loses on any bushels that are hedged prior to harvest. HPO products aid in covering those hedging losses. How farmers would react to changes in HPO remains to be seen. In history, farmers switched from yield insurances to revenue insurance with HPO when those products came available. What farmers would do with changes to HPO is difficult to examine with historical data.